The Low Carb High Fat diet, known more colloquially as the Banting diet, is not just about upturning the food pyramid and thus the conventional wisdom around food and nutrition that has ruled for the last 40 odd years. It’s about waking us up to what our bodies are naturally ‘wired’ for in terms of optimal sustenance and body weight. It’s about realising that along the trajectory of commercial and industrial ‘progress’, we’ve lost sight of our humanness, our basic biology if you will. 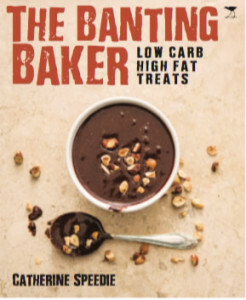 The Banting Baker has recipes for breakfast, snacks, breads, wraps, pizza as well as sweet treats. Indulge in Blueberry and Almond Mu ns, Baked Berry Pancakes with Mascarpone, Banting Coconut Macaroons, Cheesecake Swirl Brownies and ‘Top-deck’ Bliss Bars.